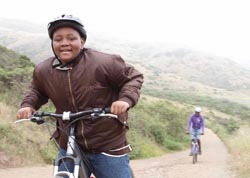 On November 1, Trips for Kids (TFK) and its Red Team of supporters won the CLIF BAR 2 Mile Challenge, a nationwide, six-month long campaign to fight climate change by encouraging people to ride a bike instead of driving a car for trips of two miles or less. Friendly competition among cyclists taking the CLIF BAR 2 Mile Challenge resulted in a $25,000 bonus grant to Trips for Kids. The bonus grant followed a $25,000 grant CLIF BAR initially made to each of the three non-profits supported by the 2 Mile Challenge. Trips for Kids has earmarked a portion of the awarded funds to go to chapters in good standing to purchase needed equipment, and create information sharing and program materials. A portion of the funds will also be used to create new TFK chapters. TFK's winning CLIF BAR 2 Mile Challenge Team included 1,994 people, who rode an impressive 166,298 miles and saved 152,994 pounds of carbon dioxide by using their bikes instead of a car. "The CLIF BAR 2 Mile Challenge really motivated our community to get on their bikes to fight climate change. I am particularly proud of our Re-Cyclery staff, including 3 of our staff who were the top three high scorers on our team," said Marilyn Price, Trips for Kids executive director. "We also owe special thanks to TFK members from Veloreview who enthusiastically supported us every "pedal" of the way. We are so grateful to CLIF BAR for this financial boost that will help us reach out to our increasingly diverse community and inspire a new generation of cyclists." While the CLIF BAR 2 Mile Challenge team competition is over for the year-slated to return in Spring 2011-the 2 Mile Challenge remains active for people who to want to continue or join, log bike miles and challenge friends to ride their bikes for short trips two miles or less.